The following is a press release issued by the County of Cape May on Monday, April 8, 2018 regarding construction work on the Townsend’s Inlet Bridge. The bridge, roadway, and construction project are all managed by the County. CAPE MAY COURT HOUSE, NJ — In September 2018, the County in cooperation with the Cape May County Bridge Commission engaged a contractor to replace spans 1-7 of the Townsend’s Inlet Bridge. Although originally proposed to be a substructure repair project, additional pre-design inspections revealed a degree of deterioration and scour requiring span replacement. As a result, recognizing the significant importance of the bridge to residents and summer commercial interests, both the design and construction contracts were accelerated with the goal of obtaining a May 22, 2019 completion date. With public safety as the foremost concern, but with keen awareness of the inconvenience and impacts the delay will cause residents and businesses in Avalon and Sea Isle City, the County and all involved in the Townsend Inlet project are working together to achieve the earliest opening date possible and will be able to better project the expected opening date in the next thirty days after key construction activities are completed. 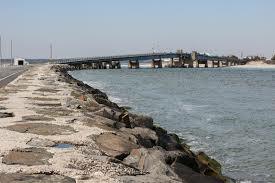 The Townsends Inlet Bridge along with all other bridges in Cape May County undergo routine scheduled inspections for the purpose of ensuring the safety to the users. Both above water and submerged elements of the bridge are monitored and evaluated, and as a result of these inspections, repair and/or replacement of bridge components is evaluated. The replacement of the seven Townsend Inlet Bridge spans arose after inspections revealed that replacement versus repair was needed in order to provide the safest and most cost-effective means resolution.